Claude Courtois has created a small farm which exempliﬁes what biodynamic is in terms of biodiversity and self-sufficiency, although he does not consider himself to be a biodynamic grower. 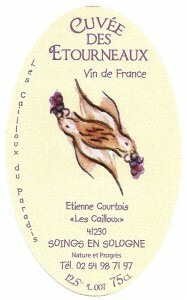 He farms a balanced & completely chemical free 13-hectares of vines in the heart of the VDP Sologne. Courtois also grows organic wheat, which he feeds to his cows. “Nothing comes into my vineyard,” he says, meaning no chemicals ever. He has created a well-balanced, bio-diversity with trees, fruit trees, vines, woods, and ﬁelds. No pesticides, herbicides, fungicides, chemical fertilizers, or synthetic chemicals of any kind are allowed on the vines or in the soil of the vineyards. He has his own methods for promoting the diverse life of the soil. The grapes—Gamay, Cabernet Franc, Côt (Malbec), Cabernet Sauvignon, Sauvignon Blanc & Pineau d’ Aunis—are harvested by hand and only indigenous yeasts are used during fermentation. Claude regards the soil on his farm as a living organism. He lives in harmony with nature and the wines he crafts are a pure and vibrant testament to outstanding Biodynamic winemaking. Claude, who is growing older, has started to pass off the winemaking to his son Etienne, who is already showing immense promise. Currently Claude only makes the Racines cuvées and Etienne is in charge of the others. Etienne is another example of the new generation taking over, bringing a new level of precision to winemaking, much as Baptiste cousin has with some of his father Olivier’s wines. As Claude did before him, Etienne is continuing the tradition of very long elevage in barrel, including up to 4 years in barrel for the cuvée des étourneaux gamay! Etienne has begun to experiment with slightly shorter elevage times, and so far we have been excited by the added freshness and acidity we see in these wines. Certification: Biodynamic (Nature & Progrès). Read an excellent piece in Vogue magazine featuring Claude Courtois here. Vinification Method: The grapes are hand-harvested, destemmed and gently pressed. Only natural yeast and the juice undergoes an extended maceration. Vinified in barrel and aged for 12-24 months in oak. 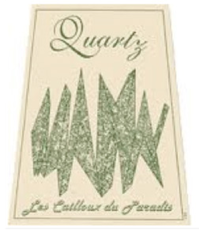 Quartz drinks well in its youth, however, decanting is highly recommended. The wine also shows aging potential up to a decade. Tasting Note: Golden straw in the glass with shimmering pale highlights. The nose offers sliced apple & poached pear backed by apple chutney spiced with brown sugar, nutmeg, cinnamon & allspice. The palate is very nutty, with a firm acidity. Yellow Apple flavors follow through and are joined by marzipan, hazelnut & hints of warm caramel. The wine finishes long and vibrant, with great mineral and core fruit presence, and a lingering inner mouth perfume of pear eau de vie. This is a truly outstanding and complex wine. Pairing: Serve with grilled sausage, braised pork loin or grilled pork chops, savory chicken dishes, paté, cured meats & young or aged mild cheeses on rustic bread. Varieties: This wine is a field blend of as many as 30 grape varieties, many of which are unknown. Vinification Method: The grapes are hand-harvested, destemmed and gently pressed. Only natural yeasts are used and the juice undergoes an extended maceration. Vinified in barrel and then aged for 30 months in oak. Tasting Note: Deep purple in the glass with a dark amber rim. The nose is redolent with pounded stones, plum, cherry pit, warm iron and damp chalk. The palate has great depth of dried currant, fig and plum hewn to a deep mineral bed. The wine has lovely acidity, a terrific structure and finishes with red berry fruit and mineral zest. Pairing: Pan seared duck breast, grilled streak, rabbit stew over polenta and cassoulet. All the complexity that biodiversity can provide a wine. Racines is Claude’s attempt at creating a wine the way Burgundy was made a hundred years ago, from many different varieties. Racines is a rediscovery, a realization of what great wine once was! Vinification Method: The grapes are hand-harvested, destemmed and gently pressed. Aged for 36-48 months in old barrels and one year in bottle. Tasting Note: Easy drinking with nice pepper notes and beautiful stony minerality. Pairing: Serve with savory chicken dishes, paté, cured meats & young or aged mild cheeses on rustic bread or simply by itself. Vinification: The grapes are hand-harvested, destemmed and gently pressed. 18 months in barrels. Vinification: The grapes are hand-harvested, destemmed and gently pressed. 42 months in barrels for elevage. 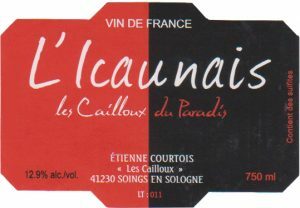 Icaunais is the local name for the grape variety gascon, a practically unknown local grape variety. Vinification: The grapes are hand-harvested, destemmed and gently pressed. 30 months in barrels for elevage.